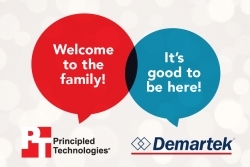 Principled Technologies (PT), a world-class marketing, learning, and testing firm, has acquired Demartek, a hands-on technology research and analysis company. PT believes the combined team will offer more benefit to its clients. Durham, NC, September 17, 2018 --(PR.com)-- Principled Technologies (PT) announced today that it is welcoming Demartek, a hands-on technology research and analysis company, to PT. Clients of both companies can look forward to the benefits of working with a larger team and a broader range of experience, while still receiving the world-class fact-based marketing deliverables to which they’re accustomed. For more information, contact info@principledtechnologies.com. Principled Technologies (PT) exists to do great work for its clients and be a great place to work for its staff. PT offers world-class marketing, learning, and testing services that help its clients win in the attention economy. Its fact-based marketing services prove the benefits of technology products through every stage of the customer relationship, while its training and sales enablement offerings earn learners’ attention and reward it with content they want. Demartek provides real-world, hands-on research and analysis, focusing on industry analysis and lab validation testing of server, network, and storage technologies, for both small and medium business (SMB) and large enterprise environments. To learn more about this acquisition, read the FAQ.